Who is the HZL-F600 For? Who is it Not For? The Juki HZL-F600 Full Disclosure: We earn a commission if you click this link and make a purchase, at no additional cost to you. sewing machine is a high-end computerized machine which will take care of all your sewing needs. A lot of thought has gone into the design and feel of the machine. While it may seem a little daunting for beginners, the machine is extremely easy to use and is easy to operate for anyone who has used a sewing machine before. This sewing machine from Juki is packed with features and accessories, letting you get started on all of your professional sewing projects. It is a machine which is built to last and one which you will get a lot of use out of. Let’s take a closer look at what makes this sewing machine so special. Juki HZL-F600 Price: $1,049.00 "I knew what Juki would deliver, as I ran Juki machines working at Levis Strauss years ago. I am not disappointed." Full Disclosure: We earn a commission if you click this link and make a purchase, at no additional cost to you. With 225 sewing stitches included in this machine, you have all you need to both sew and quilt. Any quilting machine worth its salt will have at least 100 stitch options. The Juki HZL-F600 has over double that. If you are serious about quilting, you have found the right machine. You can create simple stitches, seams, patches, and even have 16 buttonhole stitches. This is way above the industry standard for a machine like this. This machine is more advanced than most of its competitors and definitely a machine for those who are engaging in advanced products or have a business. One nice extra is the inclusion of fonts. You have 4 fonts at your disposal so you can add letters and monograms to your quilts and sewing projects. With so many stitch options, you need a way to navigate them all. This is done through the LCD screen. The screen is large and easy to read, and especially great for when you are adding lettering to your work. The screen is large enough to hold all the information you need for each project, so you’ll never make any mistakes. When you are working on quilting projects, you need a large work area to do so. The extra snap-on work surface is 8” wide and 12” long. You will be hard-pressed to find a machine which has a larger working area than this one. With so many stitches, beginners may find that they need a lot of time to select the stitch they want. This is where the keyboard on the machine will benefit advanced users. Instead of looking up the pattern in a book and then selecting it on the screen, you can search for your pattern by name. Advanced users will know what pattern they need and save time looking it up. Simply type in the name of the pattern and select from the search results. As with all machines we really like, this one also brings you an automatic needle threader, an automatic bobbin winder, and LED lamps for low-light conditions. A knee-lift lever allows you to control your presser foot without having to move your hands away from your work. There have been countless times where a project of ours has stalled because we had to stop the machine and manually lift the presser foot. With this machine, all it takes is a little pressure with your knee. The presser foot will lift, and you can move your fabric with both hands. You will never have to stop or stall your projects again. The foot controller is another nifty addition which keeps your hands free and your fabric moving. 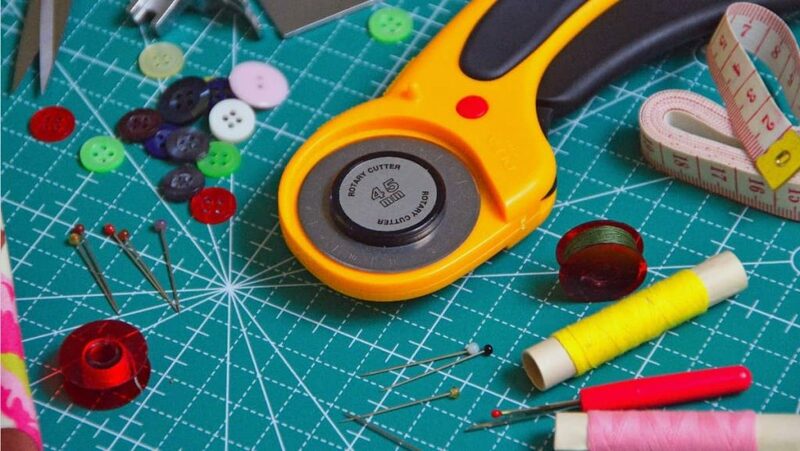 You can use the foot controller to adjust your sewing speed, again keeping your hands free to feed the fabric evenly but, more than that, you can use the foot controller to cut the thread too. With a press on the heel-side of the controller, you can cut the thread of the needle and bobbin. This allows you to move on to your next thread pattern or stitch without having to stop what you are doing and manually cut your threads. Box-feed technology is something we had not seen a lot of until recently. Most sewing machines use an oval-feed to feed the fabric. Juki uses a box feed. This means that when you are sewing, your fabric or pattern does not shift or shrink. If you are creating professional pieces or using this machine as part of a home business, you are going to get the accuracy and professionalism you crave. This machine is not the cheapest option available to you, but it is one of the highest-quality. If you are looking for a machine which will give professional results, this is the one you need. You always get what you pay for, and this machine is no exception. The Juki HZL-F600 Full Disclosure: We earn a commission if you click this link and make a purchase, at no additional cost to you. 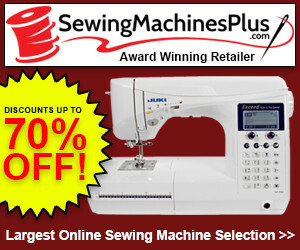 is a sewing machine for intermediate and advanced users. There are 225 stitches available, and the machine can sew in extra-quick time. If you need advanced stitches or would like a mix between a sewing machine and a quilting machine, then this machine is for you. This is also a great sewing machine for anyone who is starting a home business. The machine is completely computerized, letting you create your patterns and stitches with ease. If you are looking for only a sewing machine or solely a quilting machine, then you are not going to want this machine. It combines the two and, if you are not going to use one side of the machine, then this machine is going to be wasted on you. We would recommend a dedicated sewing machine if you are not going to use this machine to also quilt. This is a great and powerful machine. It is geared towards intermediate and advanced users. If you are looking for a sewing and quilting machine, but do not want to handle all of the features which come with this one, then we would recommend the Juki TL-2000Qi Full Disclosure: We earn a commission if you click this link and make a purchase, at no additional cost to you. sewing machine. It can quilt and sew but does not come packed with as many features or stitch options. It is not a computerized machine like this one, and is slightly easier to use for beginners. Intermediate and advanced users will love the Juki HZL-F600 Full Disclosure: We earn a commission if you click this link and make a purchase, at no additional cost to you. sewing machine. You’ll get professionalism in both your sewing and quilting. With so many stitches to choose from, you will never be at a loss for what to do. We especially like the monogramming feature which will open you up to entirely new projects. You always hear that you get what you pay for. We recommend paying for this sewing machine and getting the best. 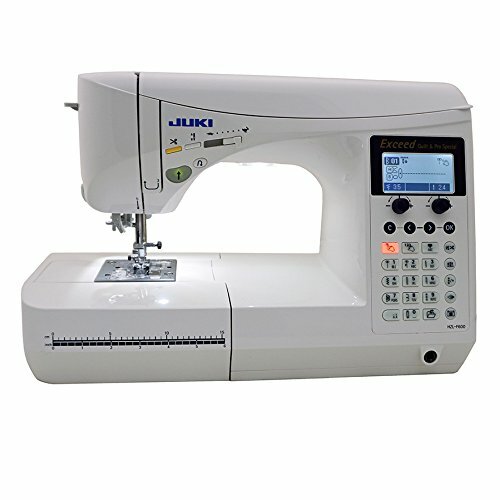 The Juki HZL-F600 sewing machine came in at #8 in our Best 12 Sewing Machines List. Here’s the full list, including the other 11 sewing machines. The following links will take you to the review of each machine. Juki HZL-F600 Full Disclosure: We earn a commission if you click this link and make a purchase, at no additional cost to you. We hope you find the sewing machine of your dreams. Remember, don't just get by... Master your sewing machine! Baby Lock Sewing Machine Reviews: Which Are Their Best Models?